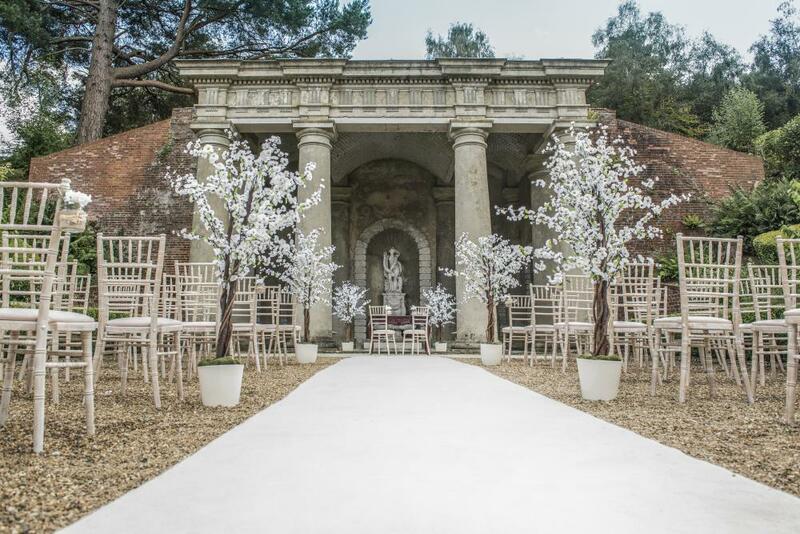 Wotton House – One of Surrey’s finest hotel wedding venues…. It’s not difficult to fall in love with Wotton House. From the impressive gravel drive way leading up to an imposing façade, the long and winding corridors within and the beautiful classic yet contemporary styling of the reception suite. This is all before we’ve even stepped foot in the quite simply mesmerising library which is licensed for civil ceremonies or outside to the gardens and al fresco secret ceremony garden. One of the main features for us is the Old Library at Wotton. 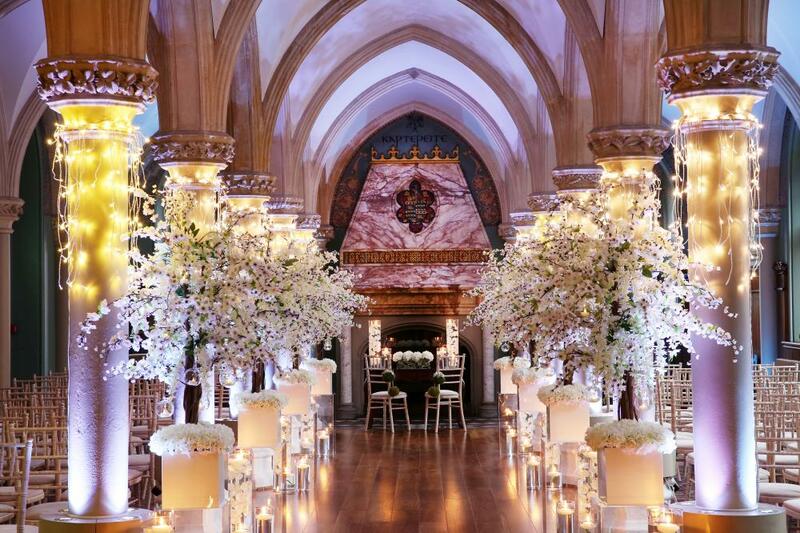 This room with its’ feature pillars and almost gothic charm, is licensed for civil ceremonies for up to 140 and surely one of the most glorious in the county to exchange vows. The long aisle, fireplace, dressed pillars and vaulted ceiling is completely charming and undeniably has the wow factor. You’ve just said ‘I do’. Your guests erupt with cheers as you are announced a newly wedded couple and you kiss in an embrace that feels as if it could last forever. You slink back down the aisle, hands locked together and are offered a glass of champagne before you are whisked outside to have photos in the enchanting gardens at Wotton. There is absolutely no shortage of photo opportunities at Wotton House. 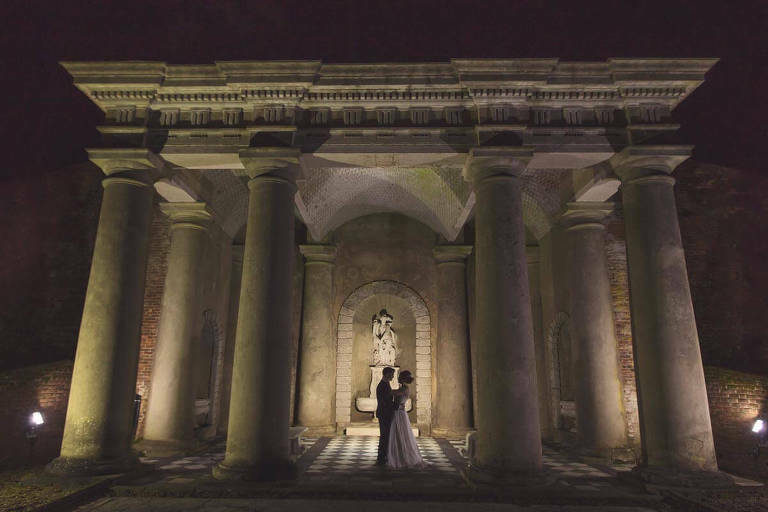 Whether you have your couple shots in the roman temple or the Italian gardens, come rain or shine, you are guaranteed memories to last a lifetime. Their 17th century gardens are deemed as such historical interest, they have been given a Grade II listing in addition to the house. Wotton have two recommended photographers; Simon Pope from Be Unveiled or Hayley Bray Photography. They have both worked at Wotton for years and are exceptional photographers, capturing special moments expertly and discretely. It’s time to eat! Catering at Wotton House is as beautiful as the surroundings, so you and your guests are in for a culinary treat. Choose from an extensive selection of seated menus, afternoon tea or buffets. Invite extra evening guests to celebrate in style; Wotton House are licenses for up to 200 guests in total for an evening celebration. Their bedrooms have, along with the rest of hotel recently undergone a £6 million refurbishment, using soft colours and contemporary touches, making Wotton House a truly unique award-winning venue. Many couples choose to host their family and friends at Wotton the night prior to their big day, extending the celebrations and being able to wake up relaxed in the morning, knowing their Parents, Bridesmaids, Best man and guests are all on site. The morning after your special day, all your guests can join you for breakfast and recount all of the days happy memories. Fun Fact - Did you know that there is supposedly a tunnel at Wotton House leading all the way into Dorking that the servants of the house used to use. There is still a visible doorway in Dorking somewhere! We are hugely proud and privileged to be the only preferred bridal supplier at Wotton House, offering every bride a unique, relaxed and fun bridal experience. An extra bonus of being a Wotton House bride is that we offer a 10% discount on any of our bridal gowns and we are also based in Dorking, Surrey. 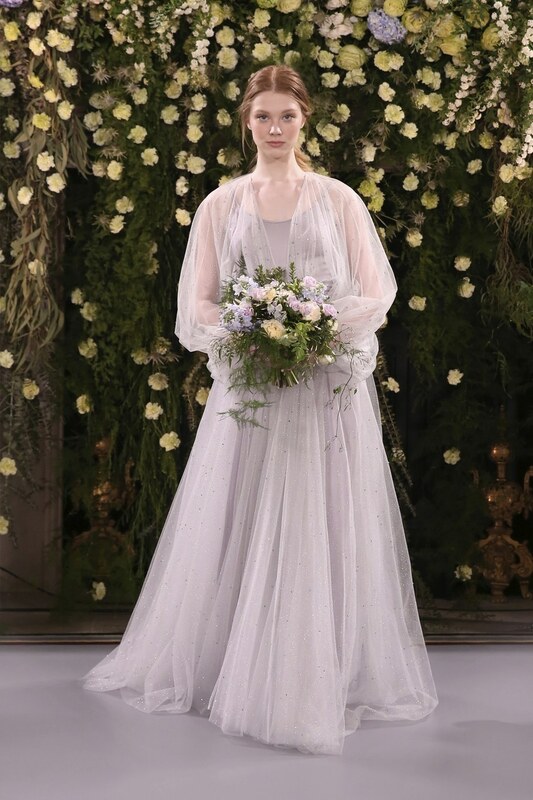 Whether you are looking for a classic yet unique princess dress or fitted silhouette wedding dress, we look forward to welcoming you to our Surrey boutique!